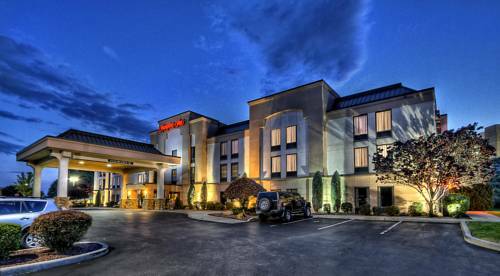 The Hampton Inn Greensburg hotel in Pennsylvania is conveniently located on the west side of Route 30 off of the Greensburg/Mt. Pleasant Exit south-east of Pittsburg. This Greensburg Pennsylvania hotel is the recipient of the lighthouse award for quality of product and service. Area attractions near the Hampton Inn Greensburg hotel include Idlewild Amusement Park the University of Pittsburgh-Greensburg Bushy Run Battlefield Westmorland Art Museum and Twin Lakes Park. The Greensburg Hampton Inn in Pennsylvania features 69 hotel rooms filled with amenities including a refrigerator coffeemaker iron ironing board and hair dryer as well as complimentary high-speed internet and cable TV with HBO. Greensburg Pennsylvania hotel guests can also request a room with a whirlpool connecting rooms or cribs or work out in our fitness center. Sure to please the busy executive or leisure traveler Greensburg Hampton Inn hotel guests will be treated to our complimentary On the House hot breakfast buffet served daily and Monday through Friday complimentary On the Run breakfast bags and USA Today newspaper. Guests staying at the Greensburg Pennsylvania Hampton Inn can enjoy the convenience of complimentary wireless high-speed internet in the hotel lobby meeting rooms and all public areas as well as coffee and tea 24 hours a day in the hotel lobby. The Greensburg Hampton Inn hotel in Pennsylvania offers the use of our meeting rooms which can accommodate up to 40 people for an all-inclusive amount that includes audiovisual equipment flipchart and unlimited coffee and tea. All stays at the Hampton Inn Greensburg hotel in Pennsylvania are backed by our 100 satisfaction guarantee. If you*re not satisfied we don*t expect you to pay. That*s 100 Hampton. We love having you here at the Hampton Inn Greensburg Pennsylvania.